The day for which you’ve waited all year has finally arrived. 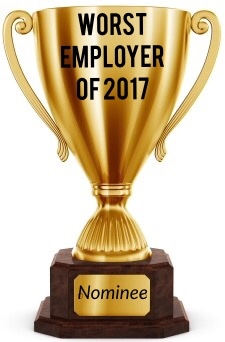 It’s your opportunity to help pick the Worst Employer of 2017. All year long I’ve been keeping a list. I’ve now checked it twice, and narrowed it down to my choice for the top 20 naughty employers. Here’s how this process is going to work. The voting will take place over two rounds, a preliminary round and a final round. I will then tally the votes, and, in early December, I’ll be back with the top 5 finalists, to offer everyone the chance to vote one last time to name the Worst Employer of 2017. So, please, vote, share this post with your friends, colleagues, and social networks, and, most importantly, learn something from the mistakes of these 20 nominees.